It's been a while since I have posted on here! Not even sure where to begin. So I will start with what is on my mind. 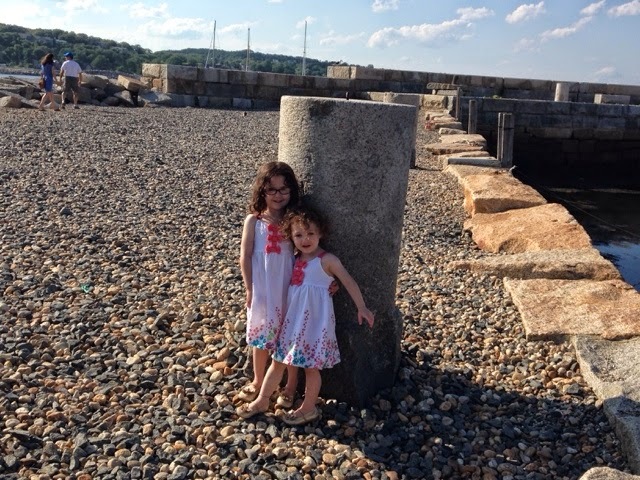 Right now I am in Rockport (a small beach town in Massachusetts)and the kids are taking a walk with their Nana. I have a few minutes so I figured I would get a bit of writing in. It's crazy to think back to three years ago when my parents insisted I come up to Rockport every week because they were worried about my mental health. And to be honest.. So was I! Ayla was only 1 month old and was a pretty cranky baby. Alexis was 2 1/2 and very happy and active. I was suffering from postpartum depression and basically just going through the motions of life. I felt hopeless and could not even imagine feeling like myself again. Thank God that after a few months and lots of help, those feelings subsided. Now it has become tradition to come up to Rockport for a few days a week during the month that my parents are here. In fact, for a while Alexis would list the seasons as: Winter, Spring, Rockport and Fall! Now Ayla is three and VERY happy. Luckily her mom's depression at the beginning of her life did not have a lasting effect on her ability to enjoy life. I still do get overwhelmed with life but it is very different than those dark days. I find myself stressing about money, the house, the future, etc. Bu when I just sit back and watch my kids, I am usually able to push through the anxiety and not allow it to take over. A few nights ago I had a moment that made me realize I needed to let the stress go and enjoy life as it happens. I was putting the kids to bed and Alexis noticed that I was wearing my new "Life is Good" shirt. She said "It should really say 'Life is Great!'" 'I realized that she was right and I am so happy she feels that way. It makes me feel like I am doing something right if my children are this happy. And it shows me that feeling happy and loved is what matters. Somehow things will work out.. Bills will eventually get paid. The house will probably stay messy. But we will be OK. Everywhere we go people comment on how happy Ayla is. It's probably because she never stops singing no matter where we are or who we are with. I am curious to see how she adjusts to preschool when she can't just belt out songs at the top of her lungs whenever the urge hits! It's wonderful that my parents share their vacation with us. The kids absolutely love coming here - playing on the beach, taking walks, getting ice cream and cupcakes, watching movies and more. I love spending time away from my house for a while! (Of course we miss Chip!) It's hard being stuck at home for days on end. This way, we enjoy a few days playing in our yard and a few days here... Breaks up the routine. And being with my mom and dad is always a treat! I am going to try to get back in the swing of writing more regularly. There is no excuse for not being able to set aside some time for something I enjoy. Heather, Jan is so right! And so is Alexis. "Life is Great!" You make life great for your girls. They are full of fun, adventure, silliness, enthusiasm, and joy! They make the world around them shine. Those dark times were so difficult, but you'd never even guess you had them by how happy your girls are. And, also, by the way your face lights up when you are with them. As for Rockport....you are the guys who make Rockport awesome. Your girls, Dom and Nessa. Their fan club on Rockport keeps growing. New traditions crop up every year. Now we have Disney nights with Trisha and Joe. You are doing an amazing job, My Heather and I am so very proud of you. As Jan says...."keep on keepin on".